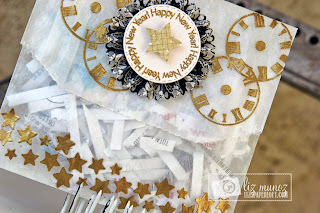 Liz's Paper Loft: MCT Sneak Peek Day #2 ~ Celebrate the New Year! Hi Everyone! Welcome to day 2 of My Creative Time's October Release! I don't know about you, but I was BLOWN AWAY by yesterday's sneak peeks! My design teammates were AWESOME and I'm looking forward to another FABULOUS day of sneak peeks! 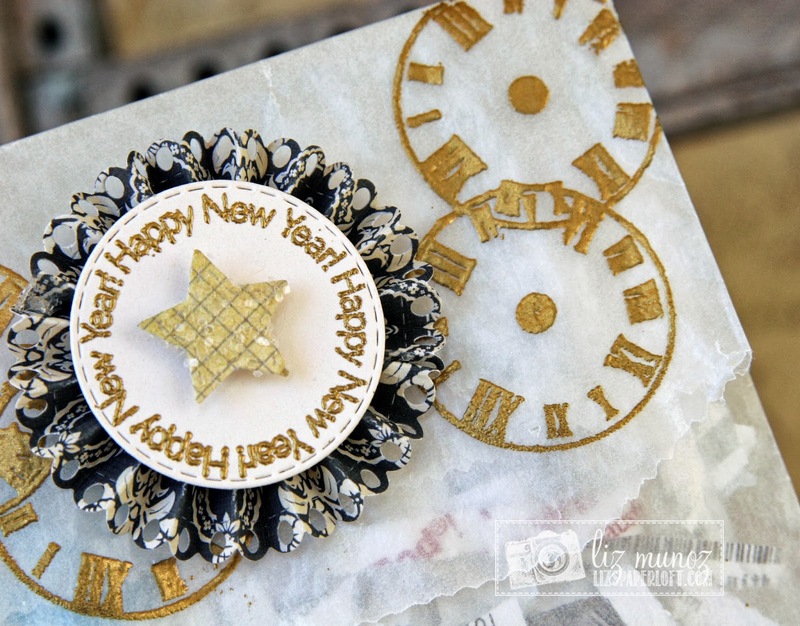 Today we are featuring the new Rosette Dies and All Around Holiday Stamps and Dies! Oh my goodness this die is sooo pretty! I did some stamping with a Versamark pad and heat embossing with gold embossing powder. I used the new Rosette die in black for a bit of formality and the star covered with chunky glitter. 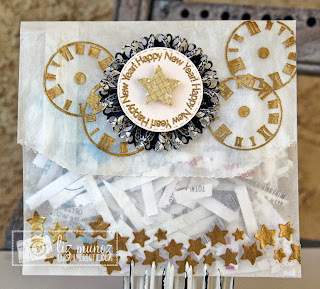 The star is just one of the new dies that comes with the All Around Holiday Stamp and Die set! Be sure to see what my design team sisters have created! Love how versatile both sets are!! Such a very cute card, the clocks are perfect with the rosette & start! Great job!! Love the idea of the bag of confetti! Reminds me of the hours I spent tearing up newspapers for confetti to throw at football games when I was in grade school. This is such a grown up, fancy version! Love the clocks and stars and embossing...very cool! TFS. Oooohhh! Love the rosette behind the circle and sentiment, so pretty. Very pretty card. Love all the detail! Love this card good man card too. Liz, This is so cute, wonderful job! Oh wow Liz your bag turned out amazing I love it. Love how you used the new day #2 goodies Love how you used all of Miss Emma's goodies. You truly are so clever and creative I mean I can't believe what you dream up just leaves me in awe all the time. I am so glad that in your busy life you take the time to share as you crafty ideas are definitely inspiring you are just so talented I know I sound like a broken record but comes from the bottom of my heart. Wow, Liz! This is just gorgeous! What a fabulous idea! The gold embossing on your bag is so pretty!!! Gorgeous...love your confetti bag...you have such great ideas!!! I like how your embellished the bags and the gold embossing is perfect. Awesome glassine bag! Your little clocks are awesome and LOVE the rosette! A know this will be a must have!! I love your project!!! So creative! Love using the clock for a New Years project! Oh how cute your fun and festive confetti bag is! Oh yes, I have been blown away both days of this release. You ladies are certainly very talented with Miss Emma's products. Such a creative use of Emma's products! Super cute! Totally gorgeous!!! I love the beautiful gold embossing on the glassine bag. Pretty, pretty, pretty! The bag looks so beautiful with the gold embossing and the black rosette does give it formality. What a great idea for the little scraps left after die cutting...a few snips and lots of colorful odd shapes. Will you be making these to throw on the bride and groom or blowing bubbles? 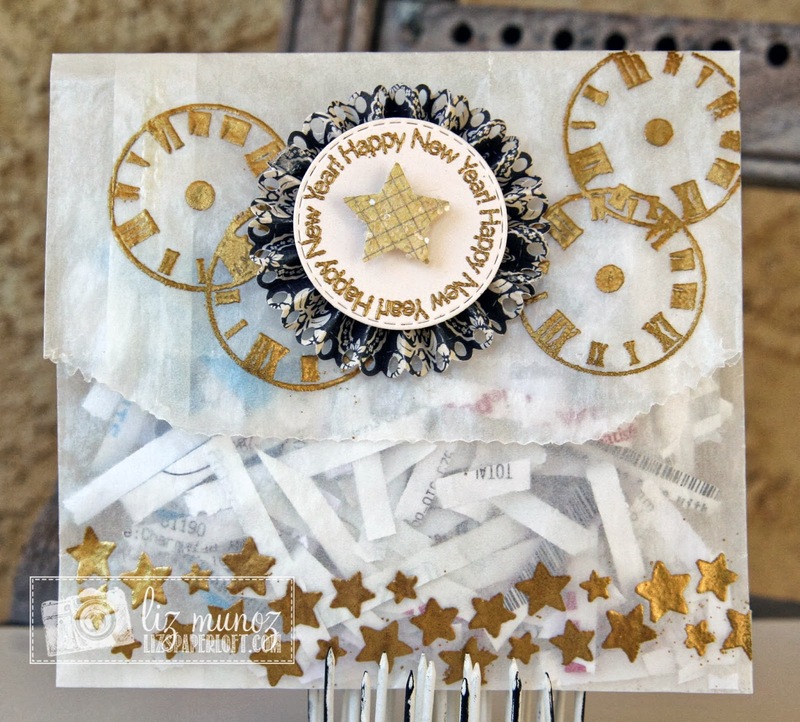 I really like the rosette, sentiments and little tiny dies. I can't wait to get them all. What a beautiful confetti bag! TFS. This is so fun Liz!! I love your New Year's bag!! What a fun New Year's bag. I just like the gold you got going on there. Great great job and thank you for sharing. Very Cute. I need to get the rosette dies. They are going to be a must have. What a fun idea! Love the bag you created and how you heat embossed on it! Cant wait to see what else you create this week! Wow....love it! I can't believe the holidays are just around the corner. Great job! Nice project, love the touch of black and the embossing. What a great idea for New Years! Elegant and fun at the same time! love all the bling! 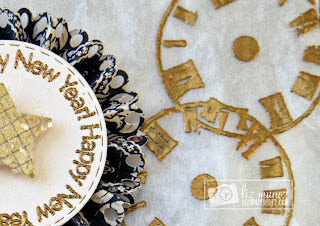 such a cute idea for a New Year's Eve party! TFS! Great idea and the clock stamp is perfect. There is not enough time in a day to craft with all the wonderful inspiration you guys provide us! Thank you. I don't normally think new years for cards but what an elegant example. What a beautiful New Year's project. Super cute idea, can't wait for tomorrow's sneaks. Your just knocking them out of the ball park with all this inspiration. How cute, love what you did with the envelope bag! I love gold embossing powder! Great job showcasing the versatility of the all around holiday stamps and dies by the whole design team! Thank you for showing such an awesome and inspiring project. Love this card. Very luxe. Very Pretty New Year's Card! Love The Gold, White & Black Rosette Combination!! Like the gold embossing and layering. LOVE your adorable bag. TFS. This is an absolute gorgeous gift bag! I love these rosette dies! So pretty! Liz ~ Bahahahaha!! I certainly know what to do with all that shredded paper now ~ THANKS! Seriously what a creative idea! WOW! Then you go and decorate a glassine bag so PERFECTLY and BEAUTIFULLY! My mind has been blown away!!! LOVE it!